Once more, STRATO is innovating! A new digital temperature sensor compatible with the BACzone 424 (presented in April 2012) has been put on the market: The Tzone. 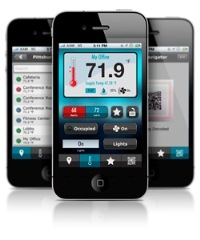 This intelligent sensor can display 10 real time values in addition to the default room temperature. With this feature, the user can easily consult different data provided by the corresponding “VAV” controller such as the outdoor temperature, the zone discharge temperature or the zone heating and cooling demand. Up to 8 Tzone can be linked together to a BACzone following the RS-485 “daisy chain” standard communication. As well, the BACzone VAV controller parameters such as air velocity configuration can be set directly from the Tzone. 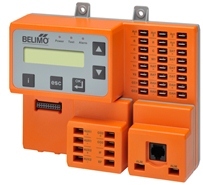 Belimo America is pleased to announce the release of their ZIP Economizer. The ZIP Economizer has been developed to allow for easy user interaction when setting up or troubleshooting Economizer systems and RTUs. The ZIP Economizer is the most technologically advanced Airside Economizer solution in the market. The ZIP Economizer is designed to provide the most energy savings through advanced economizer logic strategies. The ZIP Economizer is compliant with the most recent energy codes and standards (ASHRAE 90.1-2010, IECC-2012, California Title 24-2013, AHSRAE 189.1-2011). The ZIP Economizer reliability and feature mean economizer no longer have to be jumpered out or fixed closed and results in getting building energy efficiency back on track. For more information visit www.belimo.com or www.piccv.com. The TE2 is a Smart Wireless Peripheral. It is a fully programmable controller for fan coil units that can communicate wirelessly with CAN2GO controllers and other compatible devices. Applications - HVAC applications such as: 2-pipe fan coil; 4-pipe fan coil; Heat pumps; Dehumidification units. These wireless, compact, and stylish room temperature and humidity sensors are designed for use with CAN2GO controllers or other building automation systems. Easy mounting to flat surfaces; Reduce maintenance with energy-harvesting, solar powered technology; Save time and labor cost on installation; Choose from models with temperature and humidity or temperature with setpoint; Durable, low-profile, thermostat-style case is visually appealing. Advance technology and easy to use features are strong elements in choosing how to manage a building. American Auto-Matrix® released vSTAT®, a mobile application for iOS® and Android™ devices. Available immediately at Google® Play, and Apple® iTunes®, vSTAT allows users to access facilities and zones managed by the award winning AspectFT® Building Automation and Energy Control System. Command of lighting, fan speed, occupancy override and temperature setpoints are a few of the attributes vSTAT is able to manage. Through common internet services such as Microsoft® Outlook®, Apple® iCAL®, Twitter®, and RSS feeds, AspectFT grants Facility Managers access to the Building Automation System from anywhere the internet is available. With the release of vSTAT, American Auto-Matrix has gone further, providing Facility Managers and occupants, access to buildings through the use of smart devices. The Autani T32P Thermostat is a wireless HVAC controller for use with Autani’s StatCenter Integrated HVAC Management System. Simple to install, the T32P Thermostat is a direct replacement for many existing thermostats. Connectivity between Thermostats, the Autani Manager, and other EnergyCenter devices is via the secure, reliable autaniNet wireless mesh network. Features: Web-based, remote access and management; User-definable occupied and unoccupied setpoints can be varied based upon schedule and curtailment stages; Compatible with Autani’s MINI range of wired and wireless occupancy sensors with programmable occupancy delays; Large backlit display with keyboard locks and PIN protected installer setup menus. The Universal Communication Gateway is an external, high performance, low cost building automation multi-protocol gateway that has been preprogrammed to support BACnet®1 MSTP, BACnet®2 IP, Metasys® N2 by JCI, Modbus TCP, and LonWorks®. All Honeywell Sola, Siemens RWF40, Siemens LMV, and the Honeywell 7800 Series boiler configurations for the various protocols are stored within the gateway and are selectable via DIP switches for fast and easy installation. It is not necessary to download any configuration files to support the required applications. The Universal Communication Gateway is provided as a 10" x 12" x 6" NEMA Type 1 control panel that must be mounted and supplied with 120 Vac. The EE160 HVAC transmitter with Modbus RTU output is the ideal solution for cost-effective installation in a bus system. The precision of E+E's advanced sensor technology is combined with the latest manufacturing techniques to create a product with an outstanding price/performance ratio. The E+E HCT01 humidity and temperature sensor used in the EE160 features outstanding protection against pollution which leads to excellent long term stability and to accuracy of ±2.5% across the entire working range. EE160 is available for wall or duct mounting. The IP65 enclosure provides maximum protection against contamination and condensation while minimizing installation costs. A configuration kit allows for customization of the bus parameters and adjustment of both humidity and temperature. Beside the Modbus version, EE160 is available with analogue current or voltage outputs and additional passive temperature output. Onset (http://www.onsetcomp.com), a leading supplier of data loggers and weather stations, announced the HOBO® Green Roof Monitoring System, a research-grade system for measuring the performance of green roofs. Providing reliable performance in harsh rooftop conditions, the 15-channel system enables users to quickly and easily monitor green roof conditions, measure stormwater runoff, improve irrigation scheduling, and maintain healthy rooftop vegetation. Key advantages: • 24/7 web-based access to data; • All the common green roof measurements: temperature, relative humidity, wind, soil moisture, light intensity, and rainfall • Plug-and-play sensors that enable fast easy deployment • Customizable data display for kiosks • Trend logging, monitoring, and alarm notifications. To learn more about green roof monitoring and the HOBO Green Roof Monitoring System, please visit http://www.onsetcomp.com/green-roof-monitoring. Now available for licensing to qualified companies with a significant presence in the mobile phone market, the Fraden Smartphone Sensing patented technology and IP (Intellectual Property) employs a non-contact infrared sensor built into a smartphone or tablet to instantly and accurately measure patient temperature in less than one second with absolutely no contact with the human body. A priceless feature for parents with small children, nurses, doctors, caregivers or anyone that has ever had trouble taking a temperature, the sensor accurately detects infrared signals that naturally emanate from any surface. Just aim the smartphone at the face and it automatically takes the internal body temperature. A small infrared lens is positioned near the camera lens, with no protruding parts, making the device appear identical to existing smartphones. The sensor’s wide range, from -22 ºF to +400ºF, offers broad applications in taking temperatures of not only humans, but also of inanimate objects in the home environment, such as kitchen (cooking and refrigeration), bathroom (baby bath water temperature), school (science class), and industry (automotive and production machinery, chemical processes, energy management, and construction). For more information, see www.fraden.com. VIBCONNECT RF - wireless condition monitoring. No restrictions, great flexibility and advanced technology – these terms accurately describe our VIBCONNECT RF solution. This innovative radiobased online system offers you virtually unrestricted flexibility in the planning and installation of your monitoring solution. VIBCONNECT RF does away with costly cabling of the sensors. You also save time and money during operation, as VIBCONNECT RF is fully automated and comes with a self-contained power source. The system can be extended at any stage: simply mount the additional sensor units on the machines, register them at the radio cell and all programmed measurements are then performed as required. New “mini” automated window cleaning system is ideal for washing mid-height buildings. Sky Pro® Window Cleaning System introduces a smaller, more affordable automated window and building washing solution for window cleaning services and commercial building owners. Now there is a safe and inexpensive way to clean the windows, frames and exterior of buildings. It’s called the Sky Pro® Window Cleaning System, and it’s a technological breakthrough in automated window and building washing equipment. 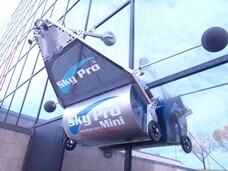 The brand new model, Sky Pro Mini™ System, is a smaller more nimble version of the Sky Pro® Window Cleaning System. It’s completely portable and ideal for cleaning windows on mid-height buildings. This makes it the perfect size for buildings with windows just out of ladder reach. Now, using this affordable automated system, a two-person operation can safely, quickly and profitably clean not only windows, but an entire building. It is much safer and easier to use than manual scaffold and boatswain’s chair window cleaning equipment. Weighing just over 100 lbs., The Sky Pro Mini™ System folds down for easy transport. Danfoss, a leading manufacturer of high-efficiency electronic and mechanical components and controls for air-conditioning, heating, refrigeration and motion systems, recently released its new generation of 435 Series Actuators, which will replace the prior AME 15QM series of actuator for the Danfoss AB-QM pressure independent control valve (PICV). The AME 435QM and AMV 435 are the first of a new design of actuators which offer improved operation with lower power consumption. This new family of actuators requires no additional tools when it is installed to the AB-QM valve bodies. The “click” on mounting mechanism of the actuator reduces actuator installation time. Standard features for these new actuators include two selectable operation speeds, external LED for visual confirmation of actuator operation, end travel LED signaling and easy calibration via an external reset button. 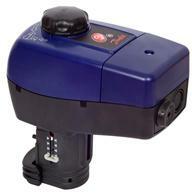 The 435 series of actuators are smaller and lighter than our previous model with 24 volt AC or DC power capabilities. temperature, the HM40 provides five calculated humidity parameters, The HM40 Humidity Meter can be chosen either in standard or remote probe version. PeopleBot is a differential-drive robot for service and human-robot interaction (HRI) projects. PeopleBot is built on the robust P3-DX base, with a chest-level extension to facilitate interaction with people. PeopleBot offers an optional touchscreen (pictured) connected to an onboard computer, for human interaction. PeopleBot has infrared table sensors to detect when it approaches a table and an optional 2dof gripper with sensors to detect and pick up a cup or other tabletop object. PeopleBot features the same architecture as other MobileRobots platforms, featuring the Pioneer SDK. With an onboard computer and the laser navigation package with ARNL software and laser rangefinder sensor, PeopleBot can navigate autonomously and avoid obstacles with precision. PeopleBots without a laser can navigate autonomously and avoid obstacles less reliably, using built-in sonar. With an onboard computer and pan/tilt/zoom camera, a PeopleBot can be used for research topics including object and people recognition and tracking, mapping, localization, or other robot vision tasks. (Use the included ACTS software for a simple color tracking software solution.) The camera may be installed on top of or underneath the top deck. When placed underneath, the camera can view the gripper, tabletop or floor.